Oh, baby! 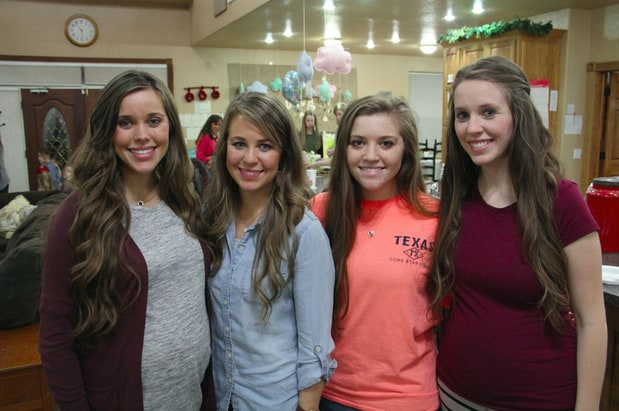 Jessa Duggar and Ben Seewald revealed Tuesday, February 6, that they had welcomed their second child into the world, but they hadn&apos;t gotten there yet during Counting On&apos;s episode on the same day. Jessa and Ben headed for a checkup on her pregnancy while Jinger Duggar and Jeremy Vuolo counted down the days until their pending nuptials. Meanwhile, Jill and Derick Dillard headed to his alma mater for a walk down memory lane. Jessa was about six months along and finally feeling more energetic as she and Ben planned an ultrasound to find out the gender of their second child. Her pregnancy had been different this time. With Spurgeon, their first child, she said she hadn&apos;t felt really strong kicks until she was about 22 weeks along, but with this pregnancy, she was getting kicked by 15 weeks. "Maybe this kid&apos;s personality is just a lot more &apos;bam!&apos;" Jessa suggested. Jessa and Ben decided they were going to keep the gender secret from everyone — except Jana and Joy, who requested to come along. This was a pretty big show of trust from the expectant parents — but they apparently trusted Jana and Joy. Asked by a producer why it was so important to them to keep the gender a secret, Jessa chirped, "Because we like to torture people!" Then she added, "No, it&apos;s just fun." Ben said it added a "challenge." "Whenever you actually get to see the baby for the first time, it just blows you away," Jessa said to the camera. Joy thought it was "really special" to be a part of that. They kicked the camera crew out of the room before the tech revealed the gender … but it didn&apos;t really matter since Jessa gave birth before this episode aired and had a boy. "As part of personal conviction, my family doesn&apos;t drink alcohol or dance," Jessa revealed. "We have tons of fun in other ways. Yeah, we&apos;re not missing out." Hey, as long as she thinks so! It turned out the guys and girls (who split up in teams in a sort of friendly battle of the sexes) were equally bad when it came to escaping. Had it been a real situation, they would have died, but it wasn&apos;t, so the guys went golfing after while the girls made jewelry to wear during the ceremony. The girls were better jewelry makers than the guys were golfers. It took Ben 21 strokes to get his ball in the first hole. Twenty-one is … umm … a lot. In a short aside, Jill and Derick revealed that, like Ben and Jessa, their second baby would be another boy. Jill was thrilled that Israel would soon have not only a little brother but also a "best friend," and the happy couple gushed that they were "so excited about this new little blessing from God." While they made bracelets and earrings, Jinger discussed her first kiss with the group. She said that she and Jeremy had decided one of them would go to the left and one would go to the right, though Jessa pointed out that if they were facing each other and did that, they wouldn&apos;t touch at all. Jinger didn&apos;t really get it, but Jessa said it was "not that complicated," and she was confident her sister would eventually figure it out. "Derick dipped me," Jill remembered, while Jessa recalled how she and Ben had saved their kiss to be in private after the ceremony. Jinger was ready to go for it in front of the crowd — probably because she wasn&apos;t about to wait one minute longer than she had to. She said it might be a little "awkward," but they were just going to do it anyway. You go, girl. Jessa still felt sad, though, thinking of Jinger&apos;s upcoming move. "That&apos;s going to be really, really tough for me," Jessa speculated of Jinger&apos;s wedding day. Jessa then noted that it was going to be hard to visit Jinger as often as she would like once they&apos;d be living 12 hours apart. Like his father before him, Derick was the mascot, Pistol Pete, at OSU. He clearly took a lot of pride in his family&apos;s history at the school and proudly toured his mother, Jill and Israel around the campus, showing highlights like his old dorm room. Later, he donned the Pistol Pete costume and headed out to entertain the fans, taking on a sort of alter ego. You heard it here first: Derick Dillard&apos;s alter ego is Pistol Pete. In a show of support, Jill rocked a T-shirt that read "Mrs. Pete" on the back. Derick&apos;s mom got misty-eyed remembering her time at the school, which included carving her and her late husband&apos;s initials into some wet pavement on campus (which was after all these years still there), and showing up at Derick&apos;s dorm room unannounced to tell him his father had died. (His father died of heart complications related to high blood pressure when Derick was only 18.) As the episode wrapped, Israel was knocking on the door of Derick&apos;s old dorm room, and his mom noted that they had come "full circle." Tell Us: Are you surprised that Jessa is so concerned about Jinger&apos;s wedding? Counting On airs on TLC Mondays at 9 p.m. ET.